Thursday, 26 April, 11.45-12.45 in the Exertion Games Lab. We will be focusing on Related Work: if you have a Related Work section of one of your papers you would like to get feedback on, please print out ca. 6 copies, double-spaced, and bring them along. 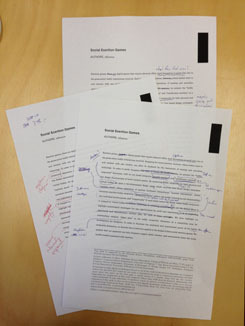 We will then edit each others’ papers, to make them even greater! Everyone welcome.